St Elisabeth’s Church is a complete delight for any devout Catholic to visit. 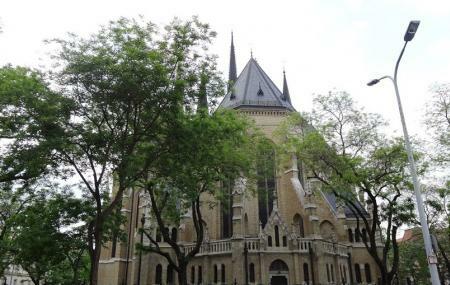 The architecture of the place is the brainchild of Imre Steindl and he has brought about the Neo Gothic aspect of the church out very beautifully. The most remarkable feature of this church are the distinct spires which you can witness from quite a lot of places in the city. The spires rise up to about 76 meters higher as compared to the average buildings of the city. The church is also surrounded by a beautiful garden of roses. That is how the name of the square around it is derived. Literally translated from Hungarian, the name of the square is “Square of roses”. How popular is Saint Elizabeth Church? People normally club together The Fat Policeman Statue and Statue Of Ferenc Rakoczi while planning their visit to Saint Elizabeth Church. A beautiful place to visit and see... Even if you are not an "everyday-going-to-church" person... It is awesome! You just don't want to miss this. And it is just a few minutes walk from Keleti railway station! Lovely little church tucked away on the Buda side. You stumble upon it when you walk along the Danube after crossing the Chain Bridge. Or you can take trams #19 and #41. Lovely scenic route. It is really pretty. Surprised more people don't come. Amazingly nice church in the "middle" of the city, really calming! Quiet and stunning. Feels like a working church, in counterpoint to the Basilica.